If you want to be included send me your review and get linked up. When I started doing bead embroidery, I was totally clueless. All I had to go on were the amazing pictures of bead embroidery jewelry by people like Sherry Serafini and Heidi Kummli. There really weren't any good, well-written instructions with tips and techniques for bead embroidery. So most of what I learned was through trial and error -- lots and lots of errors! If you want to know the secrets of making great bead embroidery, here are my top five to get you started. But be warned: once you start making gorgeous pieces of bead embroidery jewelry, you won't want to stop! 1. The color of your bead embroidery medium matters. In the beginning, I would get frustrated when the bright white of my bead embroidery medium would show through on my finished pieces. Using dark colors of beads was almost always a recipe for failure for me, and it was enough to make me want to give up. I eventually learned how to dye my white bead embroidery medium, but it was messy and took up way too much time. Then last summer, I discovered Nicole's Beadbacking, and ta-da! Problem solved! Not only do I love the thickness and durability of Nicole's Beadbacking, I love that it's a product made by a small business. And the beautiful colors inspire me to create pieces where I actually leave large portions of the bead embroidery medium showing through the stitching! 2. Don't crowd your rows. I think this is probably the mistake that almost everyone new to bead embroidery makes. Learning how to line up those rows of bead embroidery can be tricky -- you need to learn how to "see" where the thread path should go. string your next set of beads, then push them down to where your thread is exiting. Pull your thread straight and line up those beads so that they are a comfortable distance away from the previous row. Look where the thread is coming out of the last bead you strung. Make a small point or dot on the bead embroidery medium at the exact point where the thread exits that last bead. Bring your needle straight down through that point to make your next stitch. 3. Keep your needle straight. Did you know that the angle at which you stitch through your bead embroidery medium also makes a huge difference in how your beads lie within each row of bead embroidery? If you insert your needle at an angle through the bead embroidery medium, your beads will either be spaced too far apart or will bunch up against each other and make little bulges in your rows. Try as hard as you can to keep your needle exactly perpendicular to your bead embroidery medium as you make each stitch to keep your rows of seed beads nice and even in your bead embroidery. 4. Reinforce each row of bead embroidery. If your row of bead embroidery looks a little wonky, never fear. Try running your thread through the beads once or twice after you finish each row of bead embroidery. The extra thread will help fill up those bead holes and make them line up straight like good little seed bead soldiers! 5. Practice your tension. How tightly you stitch those beads down in each row of bead embroidery also makes a big difference in your finished piece. Stitching too tightly will cause your bead embroidery medium to buckle and pucker, and will make it nearly impossible to add the leather or imitation suede backing properly. Stitching too loosely will, obviously, cause problems in getting your beads to lie straight, no matter how many times you reinforce. As a beader, I tend to naturally bead with a tight tension, so it took a lot of practice for me to learn how to adjust my tension in bead embroidery. If you love to do bead embroidery, I've just discovered a bead backing that beats out everything else I've ever used: Nicole's BeadBacking. This bead embroidery medium was developed by bead artist Nicole Campanella, and is the result of her experiments with felting. Nicole's BeadBacking is a cotton blend fabric that is stiff enough to stand on its own when used for bead embroidery, yet soft and flexibly enough to allow a beading needle to pass through it easily. The first thing that caught my attention with Nicole's BeadBacking is that it comes in a range of colors. Whenever I've done bead embroidery in the past, I've had to dye my white bead embroidery medium to a different color using fabric dye. This is a messy step, but it made my bead embroidery look more professional and helped my bead colors blend together nicely. Nicole's BeadBacking bead embroidery medium comes in fourteen different colors and three different sizes, so it's pretty much perfect for whatever kind of bead embroidery project I want to do. The smaller sizes are perfect for bracelets and pendants, while the larger sizes make perfect beaded collars and necklaces. 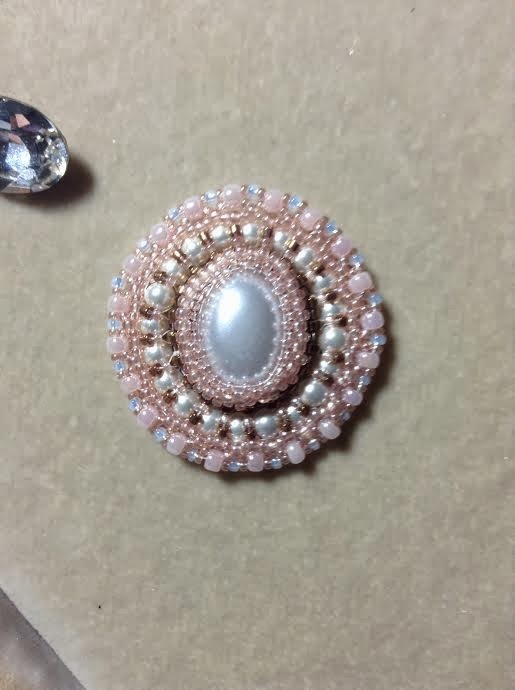 To put Nicole's BeadBacking to the test, I picked out a small cabochon and glued it down. I stitched a peyote stitch bezel around the cabochon and found that my needle went through the embroidery medium effortlessly. Even though I was using a larger needle (my new favorite size 11 Tulip beading needles), I didn't see any large holes in the BeadBacking when I had to tear out a couple of stitches. I was also impressed at how well the BeadBacking held its shape through the many rows of bead embroidery I stitched around the cabochon. I usually stitch my beads down with a tight tension, and the BeadBacking never puckered or warped as I was stitching. Finally, it was time to add my brass embroidery blank as the filling to my bead embroidery "sandwich" before I attached the Ultrasuede backing. But even after adding all those rows of bead embroidery, I found that the piece of Nicole's BeadBacking that I used was still so stiff that I probably didn't need to use the brass embroidery blank! I almost forgot to glue the bead embroidery to the blank to the back of the bead embroidery! I went ahead and included it anyway, and it made the whole pendant feel more substantial without feeling too clunky. Overall, I was very impressed with Nicole's BeadBacking for my bead embroidery projects. Nicole's BeadBacking is a thick yet flexible bead embroidery medium that takes the hassle out of creating professional-looking bead embroidery projects. You can purchase Nicole's BeadBacking in packs of assorted colors through her Etsy shop or in single pieces from her website. Grab a pack of your own. You will Love it! few days ago I received a package from Nicole of Beadwright I have to say that this is the best product. 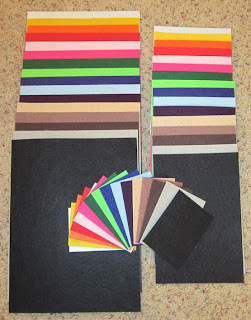 I used plain felt on my previous pieces and I can not believe how much easier Nicole's backing is to work with. The Druzy agate is a piece in progress. I'm waiting for the glue to dry on the next layer of backing I added. The dichroic glass is my next project. The backing comes in a wide variety of colors so its easy to match the backing to your work. I wish I had tried it a long time ago! Thanks Nicole! If you ever stopped selling your beadbacking I would curl up into a ball and cry!!! I love your beadbacking, and wouldn't/couldn't use anything else!!! the quality, colours, everything about it is perfect!!! not only do I use it for my beadembroidery, but I now started using it as backing to give more stiffness to my leather bags (tutorial in the making)!!! thank you Nicole for your wonderful product, perfect customer service and most of all for your friendship!!!! I started falling in love with bead embroidery by following suggestions made in printed publications from the best bead embroidery artists. It was a great place to start... but if we aren't learning something new on a daily basis then we aren't growing. So after putting countless hours into my masterpiece, I still had to go over it with a tweezers getting all of the fuzzies and straggler fibers off to make sure it looked perfect. Ugh.... and then about the time you take Eleventy-billion photos, you realize there was one itty bitty thread that my eye didn't catch, but the magnified, detailed photos highlighted like a zit on your wedding day... it became a glaring object in my photo. My search began for a better alternative... And by better, I mean MUCH better! I've been a follower of Nicole Campanella's blog (The Beadwright) for quite some time now. For a while I just read and drooled over her designs and saying "Someday I want to be able to do that." Then I had this little mishap with LSS and had the perfect opportunity to try Nicole's signature product, her beadbacking. Can I tell you... I LOVE it?!?! It doesn't fray at all. It's nice and stiff, and your needle slides through it like buttah... seriously. It comes in a whole host of colors making messy dying a thing of the past (thank goodness). And can you tell, I just love it? It comes in several different colors, so I don't have to color it myself. But I can, if I want to sketch a pattern for the beadwork. A pen works fine. It's stiff and sturdy, so I don't have to layer, fold or reinforce it with anything. It's easy to cut and trim. It's super duper easy to pass a needle through -- no more broken needles, even the size 12! It doesn't shed like felt does -- so no watering eyes and sneezing for this fiber-sensitive gal. 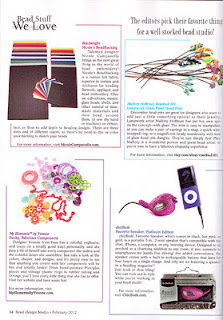 I was not expecting this great spot for Nicole's BeadBacking this month so it is a very nice surprise. 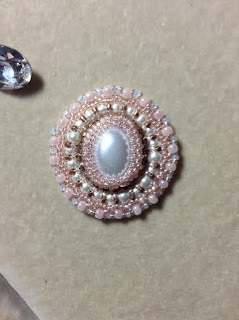 I absolutely love to finish off my pieces with Nicole's Beadbacking! It gives my embroidery and loomed pieces a very professional look and feel. I wouldn't use anything else. I ordered the kit with 14 colors. Wow! I am so in love with your product. I don't know how I beaded without this. I am working on a piece now that I will be using the pretty pink on. I get more ideas as I compare the colors. Definitely will be using this with Soutache too. I had used a different foundation when I was first introduced to bead embroidery and had a bad experience; the recommended permanent ink I dyed the foundation with always ran onto my arm when I wore my cuff. I asked other beaders what they used to avoid this from happening and was told 'Get Nicole's Bead Backing!' I use it now all the time and am very happy with the results. A bead embroidery project I designed using NBB will be published in Issue #52 of Bead Magazine, early in 2014. I am also very happy with Nicole's customer service...my orders are always done so promptly, packaged carefully, and arrive ready to go to work! Thanks Nicole, for a great product and great service.